While the moratorium on new billboards and supergraphic signs lurches toward the end of its third month, some sign companies conduct business as usual, plastering their product on walls of buildings wherever and whenever they choose. 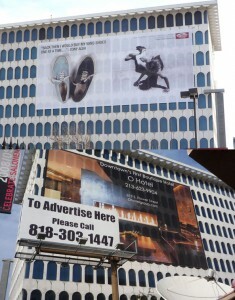 The signs pictured here on opposite sides of the same building recently went up near LAX. Even though they cover windows, the building appears to be vacant, so fire department inspectors can go about their regular business of making the rounds of occupied buildings to see that sprinkler systems are working and exit doors aren’t locked. It is against the law, however, to put up any such signs during the moratorium, and this latest conversion of a building into a billboard is consistent with the actions of a rogue advertising industry element that appears to regard the law the way an elephant regards a mosquito—at worst a very minor nuisance.